Meet our team caring for animals and our community every day. Mayhew has a great team of around 80 staff and students who are all extremely passionate about their jobs and dedicated to the welfare of the animals we care for. "I work for Mayhew because I am inspired by our ethos of improving life for both animals and people here in London and overseas." 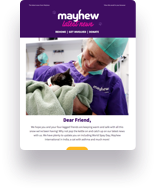 "I chose to work for Mayhew to help and care for animals in need. To spread love and affection to every animal in our care." "I work for Mayhew because of the work with the local community for animal welfare and because volunteers are such an important part of everything Mayhew does." "I have worked for Mayhew in various roles for 19 years. I am proud to be a part of the pro-active incentives in animal welfare and education." Our Board of Trustees are responsible for providing Mayhew with governance and leadership. They oversee and direct our activities and overall strategy.